GUNNAR offers the only patented computer lens technology solution, recommended by doctors, to protect and enhance your vision. GUNNAR’s custom and complete solution address and alleviates all common issues associated with digital eye strain, effects of artificial blue light, visual stress and fatigue. GUNNAR’s patented lens design is highly wrapped to limit air currents near the eyes, increasing humidity and preventing irritation, unlike many traditional prescription eyeglasses. This design enhances focus and sharpens detail to ease eye strain. 1. REDUCES DIGITAL EYE STRAIN. Eye fatigue, dry eyes and headaches are symptoms of spending too much time in front of a digital screen. 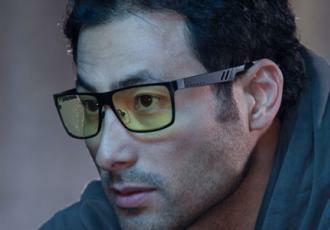 GUNNAR lens design has extra focusing power providing you sharper, clearer vision. This patented technology helps you focus more naturally creating less eye strain. 2. IMPROVES COMFORT AND FOCUS. The overabundance of bright artificial light can create a strain on your eyes. But GUNNAR custom lens tints and filters block harsh blue light and glare so your eyes can finally relax. Focus longer. Work more efficiently. Be comfortable doing it. Look around you. You probably work in an environment filled with fluorescent light, glare, and uncomfortable air currents. GUNNAR patented lens technology reduces glare and prevents dry eyes.